SeizureTracker.com - Compare Menstrual Cycle information to Seizure activity. Collect and compare menstrual cycle information to seizure activity in your Seizure Tracker account. This tool allows users to record start of the Menstrual Cycle, Progesterone levels, Basal Temperature and suspected ovulation. 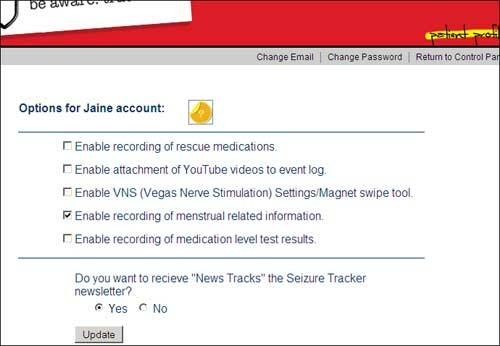 - Select the "Enable recording of Menstrual related information." option in the settings list. *Please note - Female must be selected as the gender on the profile page for this option to be available in the account settings list. The menstrual information tool will now be accessible on the right hand side of the event logging page. After submitting information into this form a "Menstrual Information" mark will be included on the corresponding day in the "By Day" graphs within your Seizure Tracker reports. 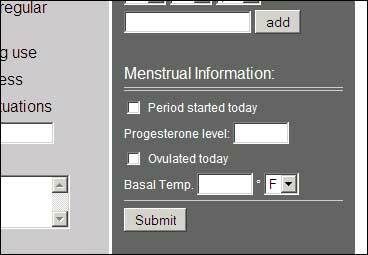 Note: When rolling the mouse over the menstrual information icon contained in the graph the information recorded on that day will appear. The blue circle icon with the yellow center represents when the "period started today" has been selected. The solid blue icons represent when "period started today" is not selected but other values have been selected.